Jacobus Clemens Non Papa’s Marian motet ‘Ego flos campi’ (I am the flower of the field) can confidently be dated to autumn 1550. Clemens was employed for a few months during the autumn of 1550 for three months by the Marian confraternity Onze Lieve Vrouwe Broederschap in ’s-Hertogenbosch. This guild was the leading religious confraternity in ‘s-Hertogenbosch and its members were devoted to performing good works and sponsoring good music in the name of the Virgin Mary whom they revered’Sicut lilium inter spinas’ (‘As a lily among thorns’). Jacobus Clemens non Papa (ca. 1510-ca. 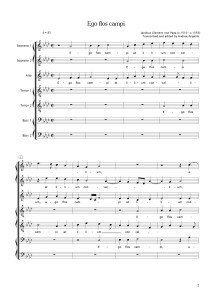 1556) was a Flemish composer whose a cappella Masses, motets, and chansons represent high points in the history of Renaissance polyphonic vocal music. Jacobus Clemens non Papa was born in Ypres, Flanders. Nothing is known of his education except that he was trained as a priest, and little is known about his career. He seems to have spent his early creative years in Paris, where his first works were published, but he returned to the Low Countries in 1540. It is known that he was in Bruges until 1545, where he served as priest and choirmaster of the children at St. Donatien. In subsequent years Clemens was active as a singer and composer at the cathedrals in Antwerp and’s Hertogenbosch, at Ypres, and finally at Dixmuide, where he died and was buried. Clemens published under the name Jacques Clément or Jacobus Clemens until 1546, after which he added the appellation “non Papa” to the Latin form of his name. Why he did this is not known, though scholars have suggested it may have been done so that Clemens might distinguish himself from a priest-poet active in Ypres at the time who bore the same name and called himself Jacobus Papa. 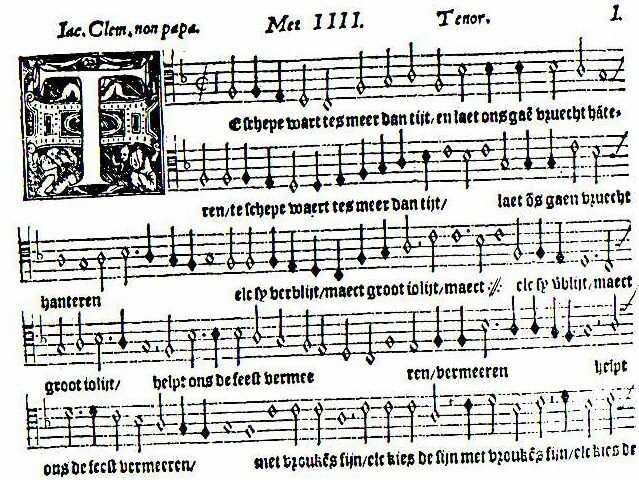 The extant works of Clemens—all works for unaccompanied voices—include 15 Masses, 231 motets, a number of songs in French and in Flemish, and 4 books of Souterliedekens, or “little psalter songs.” These last are simple three-part settings of the Psalms in Flemish that Clemens based on popular melodies of the day. These Psalm settings were intended as devotional pieces for the home, which accounts for their simplicity and easy tunefulness. By contrast, in his Masses and motets, Clemens wrote a rich and varied polyphony, with a seriousness and thoroughness typical of the Renaissance Netherlandish composers. His motets, in which Clemens shows himself ever responsive to the moods and images of his texts, are especially remarkable for both their clarity and expressive power. Many of his motets are remarkable, as well, for their unusual use of chromaticism, much of it notated in the scores, but more of it, many scholars believe, implied and meant to be added to the music only in its performance by the initiate. Clemens was an outstanding composer in an epoch that produced many composers of genius. His contributions to the genres of the Mass and the motet, in particular, stand as great monuments of the art of polyphony in the Renaissance. ⟵Che fine hanno fatto le melodie religiose eseguite durante la messa?